The PDF version of the special report is typically emailed within two business days of receipt of payment. The PDF can only be used on a total of one computer system. Only open the PDF on the computer system you want to use to view the report. After you have saved the PDF document to the computer system it can not be moved, copied or emailed to additional computer system. 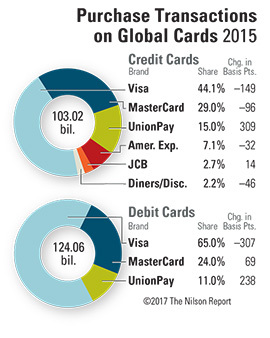 Global general purpose cards carrying Visa, UnionPay, MasterCard, JCB, Diners Club/Discover, and American Express brands generated 227.08 billion purchase transactions at merchants in 2015, an increase of 16.1% or 31.52 billion over 2014. Purchase transactions included all commercial and consumer credit, debit, and prepaid cards. Prepaid cards are included in debit figures. Visa cards, which include both Visa Inc. and Visa Europe, accounted for 55.52% of all purchase transactions worldwide. Debit cards with the Visa brand continued to account for the most purchase transactions with a share of 35.50%, followed by Visa credit cards with 20.02%, MasterCard credit cards with 13.14%, MasterCard debit cards with 13.13%, UnionPay credit cards with 6.79%, UnionPay debit cards with 6.00%, and American Express cards with 3.21%. JCB cards with 1.23% overtook Diners Club/Discover cards with 0.98%. UnionPay continued to have the highest percentage increase in purchase transactions. Last year UnionPay credit and debit card purchase transactions at merchants grew by 47.0%. Its year-over-year growth of 9.28 billion transactions topped the 8.09 billion increase for MasterCard but trailed an increase of 13.16 billion for Visa. Debit and prepaid cards accounted for 54.63% of purchase transactions, up from 54.05% in 2014. Visa purchase transactions were 63.95% debit, up from 63.71%. MasterCard purchase transactions were 49.98% debit, up from 47.86%. UnionPay purchase transactions were 46.90% debit, up from 46.00%. Total volume of consumer and commercial purchases at merchants combined with cash obtained from credit and debit cards was $25.718 trillion in 2015, up 16.4% or $3.630 trillion over 2014. Visa and MasterCard accounted for 56.62% of total volume, down from 60.04% in 2014. UnionPay debit cards accounted for the most total volume last year with $6.533 trillion. In 2014 the leader was Visa debit cards, which this year grew to $6.239 trillion. Purchase volume for goods and services, which excludes cash advances on credit cards and cash withdrawals on debit cards, grew by 18.0% or $3.110 trillion in 2015. UnionPay debit cards were the most popular payment product based on purchase volume, followed by Visa credit cards, which overtook Visa debit cards. The fourth largest was UnionPay credit cards, followed by MasterCard credit cards, MasterCard debit cards, and American Express credit cards. Visa and MasterCard accounted for $50 of every $100 in purchase volume last year, compared to $54 in 2014. UnionPay cards generated $43 of every $100, up from $39 in 2014. Visa cards accounted for $34 of every $100, down from $36. MasterCard generated $16 of every $100, down from $17. Debit cards generated 49.54% of Visa’s purchase volume, down from 50.10% in 2014. Debit cards generated 32.62% of MasterCard’s purchase volume, up from 31.63%. UnionPay debit cards generated 63.82% of its purchase volume, down from 66.02%. When comparing credit card purchase volume only, Visa’s market share of 33.98% was down 174 basis points. UnionPay’s share grew by 459 basis points to 30.73%. MasterCard’s share dropped 140 basis points to 21.97%. American Express’s share dropped 110 basis points to 9.98%. JCB’s share slipped 1 basis point to 1.94%, and Diners Club/Discover’s share fell 35 basis points to 1.39%. When comparing debit card purchase volume, UnionPay’s share grew 309 basis points to 55.19%, which topped Visa and MasterCard combined. Visa’s share dropped 283 basis points to 33.97%, and MasterCard’s share fell 26 basis points to 10.83%. Cash advances against lines of credit and cash withdrawals from funds on deposit combined increased by $519.31 billion in 2015, but as a percent of total volume cash slipped to 20.58% from 21.62%. For Visa, cash accounted for 30.59% of total volume, down from 31.85%. For MasterCard, cash accounted for 26.37%, up from 26.03%. For UnionPay, cash accounted for 10.28%, up from 10.11%. For Diners Club/Discover, cash accounted for 6.96%, up from 6.74%. For JCB, cash accounted for 3.20%, down from 3.40%. For Amex, cash accounted for 1.11%, down from 1.15%. Credit, debit, and prepaid cards in circulation totaled 10.25 billion at the end of 2015, up 8.2% over year-end 2014. UnionPay added the most cards (506.0 million), an increase of 10.3%, while MasterCard had the highest percentage increase in cards (up 11.0%), adding 156.2 million cards. Visa added 103.6 million cards, up 3.6%, JCB added 5.6 million cards (up 6.4%), American Express added 5.6 million cards, an increase of 5.0%, and Diners Club/Discover added 0.6 million cards (up 1.0%). UnionPay accounted for 53.07% of global brand cards in circulation, up from 52.09%, followed by Visa with 28.95%, down from 30.23%, MasterCard with 15.35%, up from 14.96%, American Express with 1.15%, down from 1.18%, JCB with 0.91%, down from 0.93%, and Diners Club/Discover with 0.56%, down from 0.60%. Of the total cards in circulation, 75.94% were debit, up from 74.61%. Debit cards in circulation grew by 716.3 million compared to a 61.4 million increase for credit cards. Debit cards accounted for 92.06% of the UnionPay card base, up from 90.78%. For Visa, 66.78% of its cards were debit, down from 67.03%. For MasterCard, 50.45% of its cards were debit, up from 47.18%. Visa, MasterCard, American Express, and Discover brand credit cards issued in the U.S. generated 27.58% of global credit card purchase volume, down from 30.13% in 2014. For Visa, the percent change in credit card purchase volume was greater on cards issued outside the U.S. (up 12.4%) than those issued inside the U.S. (up 10.8%). The number of Visa credit cards in circulation inside the U.S. increased by 22.3 million compared to a 19.2 million increase outside the U.S.
For MasterCard, the percent change in credit card purchase volume was significantly greater on cards issued outside the U.S. (up 11.8%) than those issued inside the U.S. (up 7.4%). The number of MasterCard credit cards in circulation increased by 20.0 million outside the U.S. compared to a 11.0 million increase inside the U.S.
For American Express, the percent change in credit card purchase volume was greater on cards issued outside the U.S. (up 8.3%) than on those issued inside the U.S. (up 4.8%). The number of Amex cards outside the U.S. increased by 2.9 million, while the number inside the U.S. increased by 2.7 million. American Express, Diners Club/Discover, JCB, MasterCard, UnionPay, and Visa brand cards generated 227.08 billion transactions at merchants in 2015, an increase of 31.52 billion or 16.1% over 2014.